Our trip to eastern Kentucky was planned around several specific events in the Maysville area so we dropped into the state from Ohio by way of the Riverview Bridge built in 1931 and a prototype for the golden Gate Bridge in California. We spent a night at the French Quarter Suites in Maysville, as genteel a place as their name implies. Check out the great view of the Ohio shore and river traffic from the dining room. Ask for a room facing the river so that you can enjoy the lights at night and spectacular sun rises in the morning. Old Washington, now incorporated into the city of Maysville has a magnificent eighteenth century street-scape complete with eighteenth century log buildings, cobblestone walks and roadways. During the annual mid-September Simon Kenton Frontier Festival that honours its founder, main street is lined with food, craft and specialty booths. 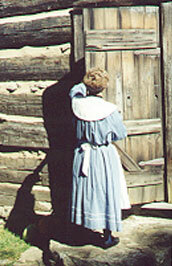 Historic homes are open to the general public and historical re-enactments take place. Special activities keep children busy. Of special interest is the fact that Harriet Beecher Stowe was inspired to write Uncle Tom's Cabin after seeing a slave auction on the steps of the court house in Old Washington. She often visited with friends in the village. Time your visit to enjoy lunch at Marshall Key's Tavern. An historical drama is staged on Friday and Saturday in a natural amphitheatre in the centre of the village. The entire community, along with re-enactors is involved with bringing the community's early history to life. It is amazing what ingenuity and love for community can produce. Maysville is known as the city of spires. Take time for a walking tour of the historic area. 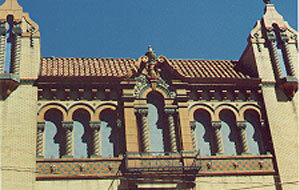 Be sure to look up at the extraordinary architectural detailing on second and third storeys in this community. If the Russell Theater is open during its restoration phase, drop in for a look-around. Leave a donation if you can. The Russell is a fine example of Art Deco Theatre style. It has seen hard times but a group of dedicated people is overseeing its restoration. The theatre is associated with Rosemary Clooney who was born in Maysville. As a matter of fact, Maysville does hold a music festival weekend each year devoted to the movie star. Blue Licks Battlefield State Resort Park is a short drive west of Maysville. Thousands of buffalo once made their way to the salt lick after crossing the Ohio and climbing the river's high bluff by means of an ancient trace. Elk were plentiful in the area too. Recent excavations around the natural salt lick reveal that mastodons also obtained their salt requirements at what is now called Blue Licks. Because we wanted to enjoy Carter Cave State Resort Park, and planned to arrive early in the morning, our next overnight was at the Holiday Inn Express in Grayson. Caves are "us"! It is a short distance from Grayson to Carter Cave SR Park. After booking a tour of Cascade Cave we hiked the trail to Bat Cave, passing under a natural bridge on the way. This particular bridge has a road over the top. Bat Cave is often off-limits as the rare Kentucky brown bat winters over in its cold depths. The cave tour at Cascade is a treat because there are a minimum number of electric lights and a maximum variety of bats, spiders, salamanders and other cave creatures. The system is unusual because it is really a tour of several caves, one that has a stream running through it. Water dropping sixty feet down a spectacular rounded hole gives Cascade its name. Lighted and unlighted tours are conducted through X Cave, Saltpetre and Cascade. 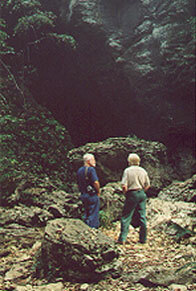 Experienced spelunkers have their own tours. If you are planning to do any hiking or caving be sure to dress appropriately and to wear proper boots. Carter Caves Resort State Park has a lodge, cottages, camping, a dining room, nature trails, boating, swimming, fishing, tennis and trail riding. Special events are held throughout the year. Your next stop should be Kentucky Folk Art Center in Morehead where the best of Appalachian folk art is on display. For people ‘in the know", there is a great difference between folk art and the current craze, folk craft. The Center's upstairs gallery hosts rotating and special exhibits. Their gift shop is full of creative items. Daniel Boone National Forest in Eastern Kentucky was established in 1937 and covers more than 680,000 acres. Cave Run Lake is 8,270 acres and entirely within the park as are a number of other significant areas including Red River Gorge. Shunning the parkways and Interstates, we next took the scenic byways leading toward Natural Bridge State Resort Park, driving through an area crisscrossed with faults, uplifts and dips. We traversed mountain ridges, passed Cave Run Lake and skirted the Red River Gorge Geological Area before "spiraling" down-mountain and through NADA tunnel. Red River Gorge is geologically significant with great natural features including volcanic kimberlite pipes, interesting mineral deposits, sandstone cliffs, rare plants and animals and more than 150 natural arches. A large number of folk artists and crafters live among the hills and valleys in this area. Feel free to stop at their shops or plan to visit during Folk Art Days in late June, Tobacco Festival or Crafters in the Park at Grayson Lake State Park during early September. Natural Bridge State Resort Park comprises 1981 acres situated near Red River Gorge Geological Area. Among its features are at least nine trails ranging from one-half to nearly eight miles. Some of the trails link with the Red River Gorge area. Natural Bridge SR Park is named for a seventy-eight foot long, sixty-five foot high natural arch found within its boundaries. You can reach the bridge via a Sky Lift or by a three quarter mile hike which starts near Hemlock Lodge. Remember, if you are not used to hiking, don't attempt to hike the more strenuous trails. 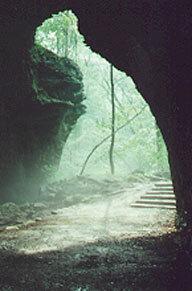 Natural Bridge State Resort Park is an excellent overnight destination or home-base for exploration of the area. Their amenities include, lodge, cottages, dining room, hiking trails.